Paradise: clear waters, beautiful beaches, lots of sunshine…why did I leave again? This trip was a great break from the snowy winter. Reading about Cancun,all the guides talked about fresh seafood, Mayan foods, and alcohol in the forms of magaritas, pina colodas, and Mexican beers. Of course it is also known as a spring break destination. This post is about highlighting the dishes that I ate during my trip at my hotel, downtown Cancun, Isla Mujeres, and Chichen Itza. One of the first stops was at a really touristy restaurant called La Parrilla. They come with English menus prepared, a guy that goes around taking photos of you, and large alcoholic drinks. 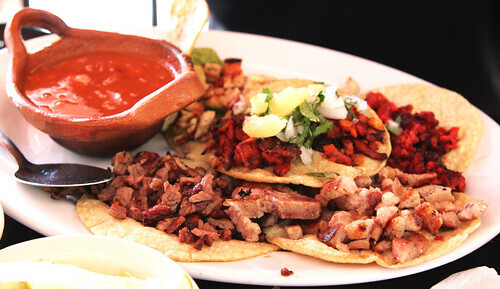 Pictured above is the five taco appetizer which has one of each: pastor (pork), sausage, grilled chicken, grilled steak, and tilapia. They were okay but nothing really stood out. 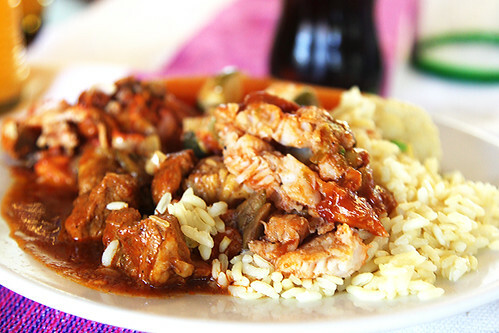 This is a traditional Mayan dish – Cochinita Pibil. Basically it is marinated pork meat in citrus juice with annatto seed. They roast pork meat while it is wrapped in banana leaf underneath the ground for a long period of time. The result? Fall-off-the-bone meat that is nicely spiced and flavored. Clearly the Mayans knew what they were doing when it came to pork. 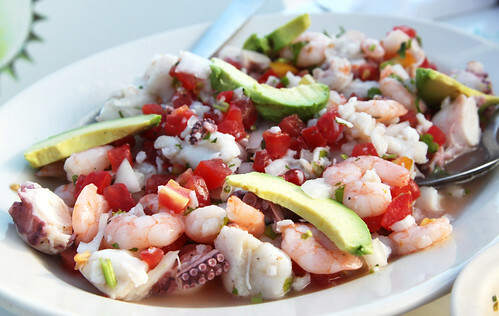 A very typical dish in Mexico – seafood ceviche. 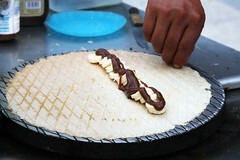 I got to eat this right by the water on the Isla Mujeres right after snorkeling. It was very refreshing and the seafood tasted very fresh. They add lime which added a slight citrus tang and helped highlight the flavors of the shrimp, octopus, and fish. 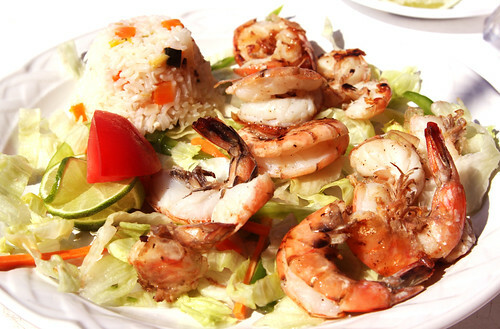 Grilled shrimp with vegetable rice, lettuce, tomato, and lime was very good. It was simply cooked and nicely cleaned (no shrimp vein!). It’s great island food and definitely a pleasure to eat. The shells came off very easily and paired nicely with the tortillas they provided along with the meal. 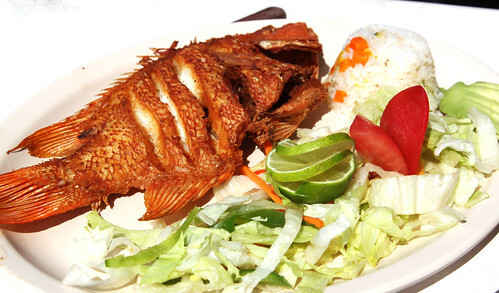 A whole fried fish served with vegetable rice, lettuce, tomato, and lime is pictured above. Unfortunately I’m not sure what type of fish this was, but it was very easy to eat because it was lightly fried. It had a crunchy exterior to the soft white meat, and not oily at all. 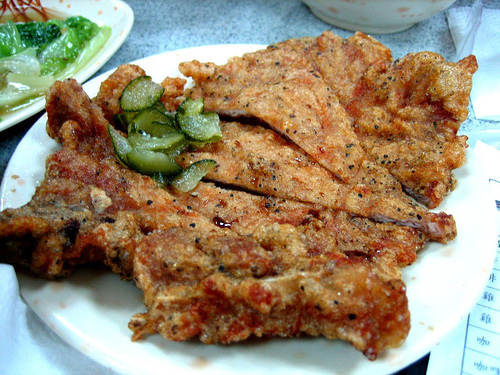 I certainly wouldn’t mind eating some whole fried fish again. 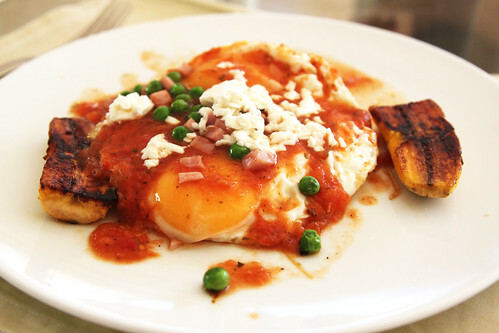 The last savory dish is comprised of two fried eggs, cheese, ham, peas, tomato sauce served on an English muffin. It was served fried plantains. It felt like a brunch dish I would eat at a Mexican brunch in New York. I devoured the whole plate because it was so good. The combination of runny eggs with ham lightly sprinkled with cheese gave this dish a two thumbs up. And onto dessert! 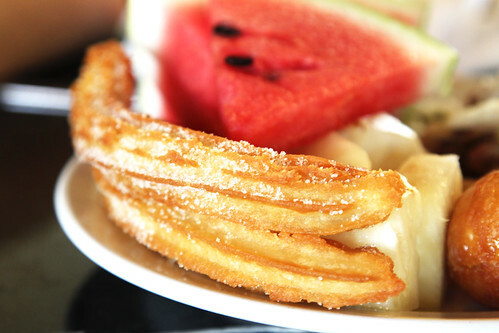 Churros are always good – crispy outside, soft inside, lightly coated with sugar. They weren’t very big but just enough to end the meal. 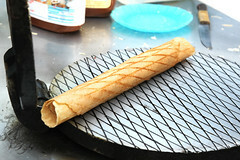 Maquesitas are thin waffle crepes, a easy dessert to eat whilst walking around. I ordered the banana with nutella and caramel. Oh, it is as good as it sounds. I would definitely order a few of these at once if I had the chance in New York. 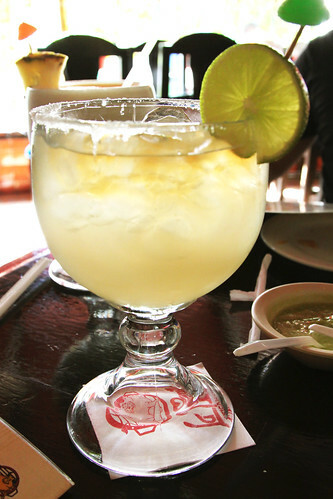 Last but not least, a picture of a huge margarita. Mexicans definitely take pride in making tequila (shots, shots, shots) and fun tropical drinks i.e. pina colada, margaritas. It was pretty intense but all in the spirit of Mexico! 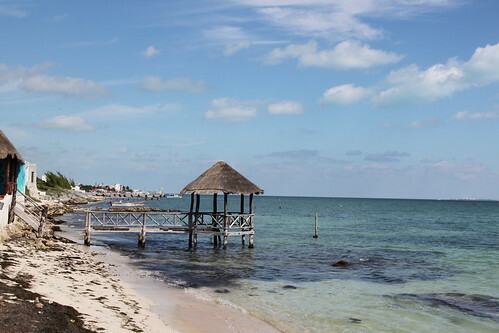 Cancun isn’t a culinary capital and many dishes are often overpriced, but at least you can enjoy the beautiful beaches and sunshine. It was a great to leave the cold, enjoy some fresh seafood, and see Chichen Itza.